Wet Seal, the clothing retailer of your youth, has fallen on tough times lately — but it&apos;s not for bad reason. While the main cause of Wet Seal&apos;s demise is financial, a sign posted by employees in a Seattle store reveals that plummeting stock prices isn&apos;t the company&apos;s only problem. According to the sign, which originally appeared online on Reddit, an employee received a raise of just 16 cents above minimum wage after five years of service, while the company&apos;s chief financial officer got a $95,000 raise in spite of the company&apos;s financial woes. It&apos;s unclear where these numbers come from; according to the Wall Street Journal, the now-former CFO received "compensation valued at $763,201," which included a $50,000 bonus, at the end of the last fiscal year. Moreover, the sign says employees weren&apos;t paid for unused sick time or vacation days, and employees that were let go only received one day&apos;s notice, despite years of work at the store. Employees were also unable to transfer store locations, unless they reapplied and interviewed. 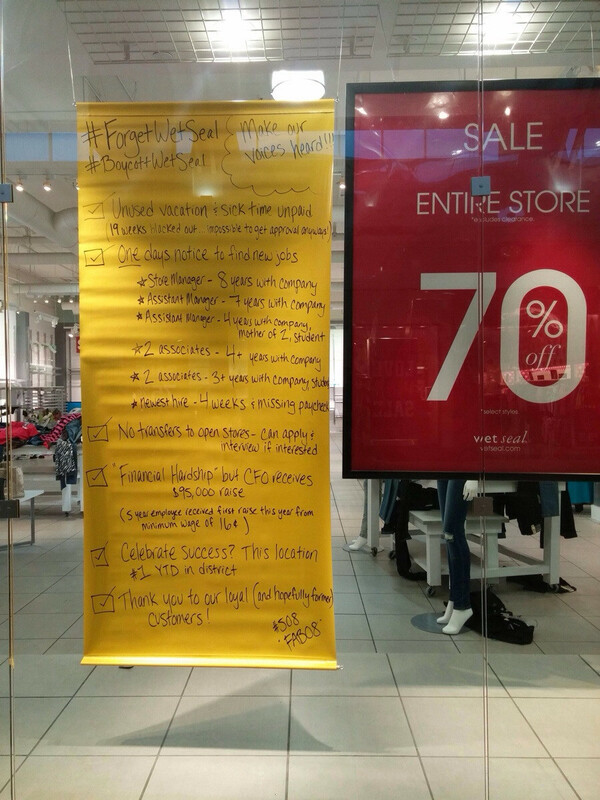 Employees also started the hashtags #ForgetWetSeal and #BoycottWetSeal on Twitter, which garnered the sympathy and disdain of tweeters across the Web. This is likely the nail in the coffin for Wet Seal, whose sales have declined in 11 of the last 12 quarters. Wet Seal is just one of the many retailers in the teen sector that have foundered over the last decade, and may be on the road to joining the likes of bankrupt Delia&apos;s and Deb. The company&apos;s poor treatment of employees is yet another reason to add to their long list of problems that includes "mounting competition, poor management and an inability to connect with the core customer." In 2013, Wet Seal paid $7.5 million to settle a racial discrimination lawsuit that the Los Angeles Times reports "accused the teen retailer of firing black employees to present a blond-and-blue-eyed front in its stores." While the demise of many a teen girl&apos;s staple clothing store might&apos;ve been a sad goodbye, the allegations on the employees&apos; sign make it a lot easier to let go.